While you are out there checking to see if your crop is ready to cut/harvest is a perfect time to also check for disease! 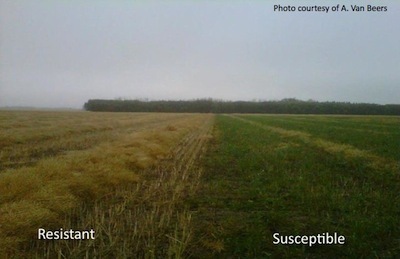 Likewise, the representative sampling technique used to accurately determine the stage of the crop is also ideal for disease scouting of your field. Pulling out a few plants and checking for the big three diseases, as well as any other issues, will save you an extra trip to the field. Early disease detection could save you thousands of dollars down the line! A vivid new video from the Canola Council of Canada zooms in on blackleg, showing how the canola disease infects a plant, how it spreads throughout a field, and what growers can do to protect blackleg resistance traits. The video, called “Blackleg Disease and Resistance Management,” is posted at www.youtube.com/canolacouncil. Keys to blackleg management: 1. Assess your risk and avoid planting into a high risk situation. 2. Add diversity to your operation by rotating crops, canola varieties and fungicides. 3. 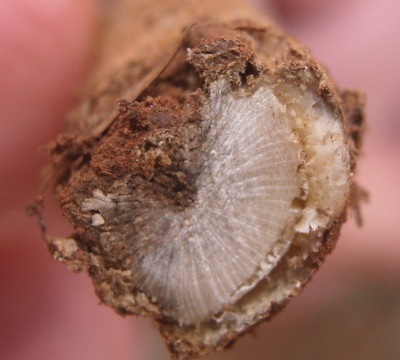 Learn to identify blackleg and assess disease levels in your fields. 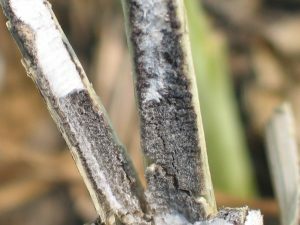 Growers are encouraged to check maturing crop for blackleg infection. It’s too late for fungicide to provide any benefit, but checking now can help plan for next year. Try to figure out why blackleg is worse than usual. It could be tight rotation. It could be use of a less resistant variety. Take steps to avoid that situation next time. Early blackleg infection — from the cotyledon to 3-4 leaf stages — leads to the greatest yield loss. If growers see blackleg lesions on cotyledons or leaves early in the season, this may indicate a greater risk of potential blackleg problems. Fungicides are registered for blackleg management in canola. Is that sclerotinia or blackleg? Growers seeing stem lesions or pre-mature ripening should take a closer to identify the cause. There is a good chance it’s sclerotinia. But it could be blackleg. It’s important to identify the cause because it will help in management for next year.